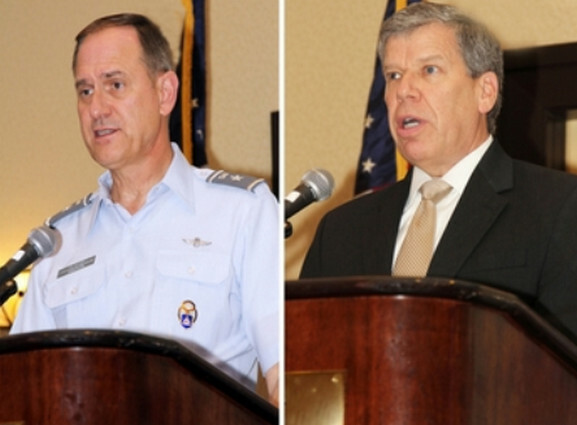 WASHINGTON, D.C. – Brig Gen Rich Anderson, Civil Air Patrol Board of Governors Chairman, and retired Air Force Maj Gen John Speigel, Board Vice Chairman and Governance Committee Chairman, provided CAP’s National Board members with an update March 3 on the committee’s progress. The Governance Committee’s primary goal is to better define the role of the BoG, the National Board and the National Executive Committee, Anderson said during the 2012 Winter National Board meeting, noting that the committee’s work is at the midway point of completion. The committee was formed after the BoG received an external governance study report submitted by BoardSource, a nonprofit organization based in Washington. The report addresses longstanding governance issues and includes recommendations designed to ensure best practices in the organization’s governance structure. A parallel, internal study has been ongoing by CAP’s Governance Committee, chaired by Col Tim Verrett, Pacific Region Vice Commander. The BoG is and will continue as the organization’s governing body, as established in Federal law. There will be the same interplay between National Headquarters’ management of programs, the volunteer staff’s ensuring members are trained and ready to perform CAP’s three congressionally chartered missions and CAP-USAF’s continuing to provide advice, liaison and oversight. Each of these three critical elements will remain intact, Anderson said. Be the first to comment on "CAP Board of Governors Governance Study"